I just discovered if you have a mannequin with the full Santa outfit, it's worth 30,000 HHA points! I missed out as I didn't realise I'd need the Santa beard. I've managed to get Solemn, Scary and Jolly paintings spare and that to my knowledge are genuine if anyone is interested. I haven't got a clue what artwork I have and haven't got. I'm quite fortunate that I live in a village full of art thieves who seem to want to sell me paintings every other day. Anyone else experienced this? I've once bought a dodgy painting from one of my villagers, it was the only time I've seen it happen though, my villagers favourite thing seems to be going to one another's house, what do they take me for? A Friend or something? Whilst I'm talking friends I remembered that another one of my spares is pics of both Puddles and Tipper as both felt the need to give me two pictures. I haven't received a single villager pic in this game yet. I will get round to charming my villagers one of these days, Tangy is ace. I wonder if there'll be some kind of new furniture set next month? (Though it would be running parallel with the Snowman sets, so probably not. It'll be the "Holidays are over" set. All the furniture is grey, square, and when you turn the TV on, you only see a black screen with the words "F*** OFF" written on it. Sounds like my kinda holiday. It's a pity you can't rig your house up with tinsel that falls down every single time you enter the room. Real mature. I love it! 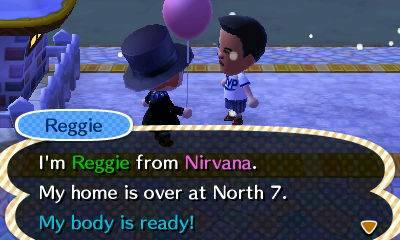 And Reggie's is not so surprisingly full of Nintendo items. His avatar is pretty cool and seems so much better than the ones we can make. Has anyone managed to play this every day since release? I was listening to a podcast on which someone was talking about playing it each & every day. I thought I might've, but it's only 2-3 times a week. I played it everyday from when I first started it (June 14th, it's release date) until the middle of October. Nowadays, I'll fire it up three or four times a week, rather than that number of times each day. I thought 'being Santa' was great fun. Another example of how Animal Crossing on 3DS is the best it's ever been. My GotY, unquestionably. I've missed about 2 days I reckon, I mainly just follow the daily routine but it helps that I still have things to aim for. Right. So. Apart from Amiibo adding new villagers... is there more to this update? Seems a weird time in the game's life for a minor thing - mind you, they did say there was going to be a Direct. Was there anything I missed? That's pretty much all I've noticed but they could have more in store, if not it could likely show off the mobile game or if we're lucky something on NX. Ah, of course - good call, I'd forgotten about the mobile game. I remember them saying now that there would be some kind of link to a mainstream game system. If anything that just raises further questions! And Drunka is now lost to the world of Animal Crossing again. I'm gonna have to poke my head in and try out the new features a little. 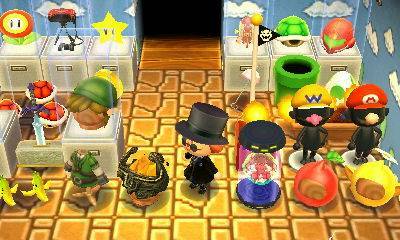 Technically, there is now a way I could get my favourite villagers back, by buying their Amiibo cards... I even went on ebay and looked up a Kid Cat card. But no. I said goodbye and I have to let him go. I agree 100%: the impact of your awesome Gintendo ACNL post would be significantly diminished if you went and brought the feller back into the fold. First impressions: they've made the best game on the 3DS even better. The campsite is a smart addition, and the decision to take the single best bits from Happy Home Designer and amiibo Festival is inspired. I've not done much with the amiibo stuff or the MEOW points, but there's lots to be cracking on with beforehand. I feel I've been duped - and I'm loving it! It's really just Animal Crossing GOTY edition, which is the sort of thing, where I had the original game, I wouldn't consider playing, let alone buying. But I haven't had to buy it, and... but... do I really want to start again playing Animal Crossing New Leaf from scratch? 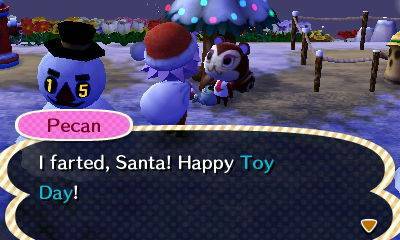 I'm really regretting selling my copy of New Leaf. Somehow I don't think it'll be the same starting anew with all this new content existing from the beginning, versus loading up your old town with all your memories in it and seeing *new! * developments. Also: Puzzle League is back! I'm excited by the idea of an Animal Crossing themed Puzzle League. I'd pay money to have that on my 3DS separate from having to fire up AC:NL.